I recently went looking on the web for a decent launch pad that could withstand larger rockets, allow 360 degree swiveling of the launch rod, hold a variety of launch rod diameters, and collapse for easy storage and transport. I was disappointed with the results and was shocked to find some pads costing well over $200!!! During my search I found a few useful sites with instructions for building your own, but most were insufficient or were barely better than the cheap pads that Estes puts out. So I decided to design and build my own. 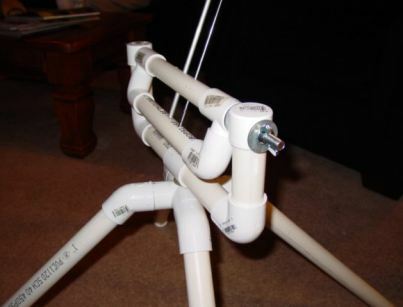 One site I stumbled upon had a good design (by Bill Owen) for the launch pad legs, which are made out of standard PVC with 45 degree elbows. But the rest of the pad, in particular the attachment of the launch rod, was not very accommodating. I based the design of my pad on this base, but added the ability to swivel the rod attachment both left and right as well as forward and backwards. Here are the plans. I bought a couple of t-connectors and sawed off one extension from each, then epoxied a washer into the opening (there's a little lip left, just beyond the cut, to snug the washer into). I then dremelled the hole in the washer into a square shape for the carriage bolt. Another great alternative: 3/4" PVC plugs are flush - drill a hole into one and epoxy a 3/8" lock nut. Then mount it into a 3/4" Tee. Use 3" of threaded 3/8" rod instead of the carriage bolt. Another reader had good luck simply dremmeling the end plug directly and attaching the carriage bolt that way. 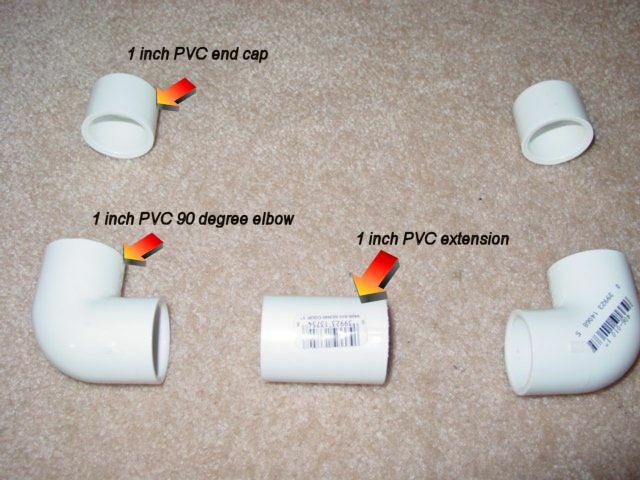 All of the PVC connectors should NOT have threads and should have smooth receptacles for inserting and gluing PVC pipe. Other materials you will need: PVC cement, ruler, needle nose pliers, hacksaw or PVC pipe cutter, Dremel rotating tool, and a power drill with a 3/8" bit, and whatever bits necessary to drill holes for your launch rod sizes. 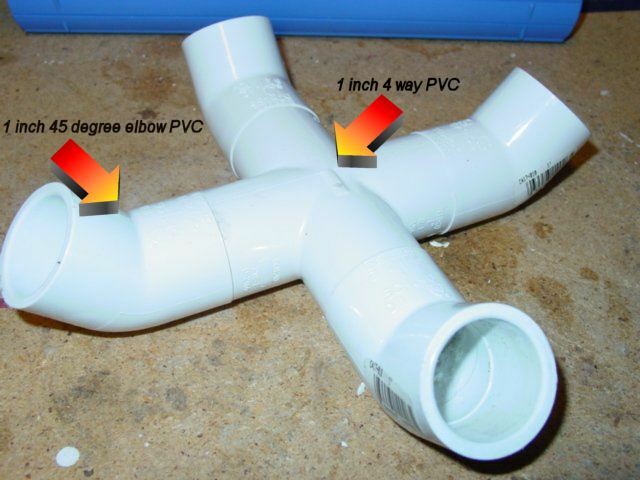 Attach 4 of the 1" end caps to the 4 23" PVC sections to make the legs. Pound them all the way on (you probably don't need to bother with the glue). Do not glue the legs to the center section -- taking them off and on makes the pad very portable. I suppose if you don't care about that and you want a small amount of additional stability, you could glue them. Drill a hole in the middle of the crossbar from figure 4 which will allow attachment to the base. The hole should be parallel with the two arms of the U-frame so that the arms will point straight up when attached to the base. Now to the only really tricky part of the pad. You will need to dremel out a square hole from the middle of the end of both flush 90 degree elbows. This allows the carriage bolt to grip the inside of the elbow so you can tighten it down with a wing nut without worrying about the bolt slipping around inside the elbow. It doesn't have to be too exact, just enough so that the carriage bolt catches. Start by drilling small hole (1/4" or 1/8"), then gradually trimming down to fit the bolt. Use the bolt to test fit periodically while you are grinding. I'm sure there is a better way to do this, but I'm not an expert on carpentry so I wouldn't know. 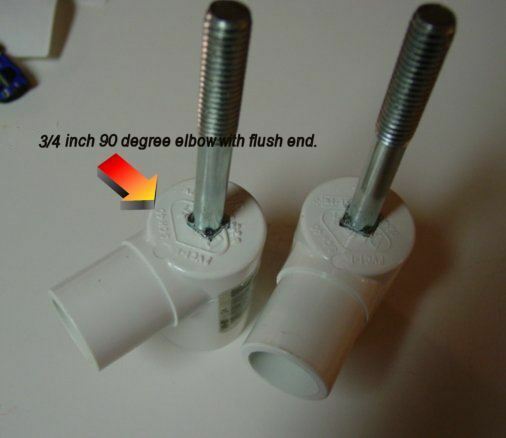 :-) When you are done the bolt should stick out of the flush end like in figure 6.2. Take the piece with the carriage bolts sticking out, and insert one end into the U frame (the carriage bolt should go all the way through), making sure a washer is on both sides of the U-frame end cap hole. Secure in place with a wing nut. The other side is trickier to attach since the bolt is sticking out. You will need to push the bolt so it's flush with the end of the elbow, move the elbow into position next to the hole on the other end cap, and then use a needle nose pliers to slowly work the bolt through the end cap. This is why you need the hole in the elbow to access the bolt. Secure the other carriage bolt with another wing nut. You should end up with a piece like in figure 8.3. Now before gluing the remaining part of the rod attachment, you will need to test fit it and see if you have a drill bit long enough to drill holes for your launch rod (I recommend drilling your largest rod diameter hole in the middle for weight and balance issues). 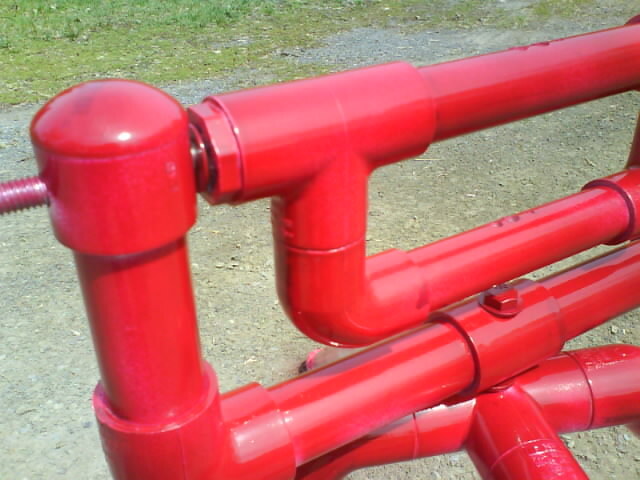 The drill bit should be able to go completely through the top pipe, and only half through the bottom pipe (so the launch rod can rest on the bottom of the bottom pipe). If not you will have to drill the holes separately like I did. For me, the drill bit was barely short, so I attached the pieces (without glue), drilled through the top, and pushed the bit as far down as possible, then marked the bottom pipe. I then disconnected the bottom piece and drilled on the marks. You could also drill the top pipe, then insert your launch rod through the top hole and mark exactly where it touches the bottom pipe, disconnect, and drill half way through the bottom piece. Finally, when your holes are drilled, you can glue the bottom section to the top section. Attach the assembly from figure 9 to the base using the 4" by 3/8" bolt, a couple of washers, and the remaining wing nut. Put on the legs and then throw in a launch rod. If you drilled the holes perfectly straight, the rod might be loose, and will need to be secured in place so it doesn't fly up with your rocket and skewer some poor spectator's eye balls. You can buy these little tiny clips at Home Depot in the tools section for about 50 cents each. They are strong enough to lift the entire pad by the rod. Attach the clip as in figure 10. Lastly, you will need a blast deflector. You have several options. I used the blast deflector that came with my friend's Aerotech Mantis launch pad (whose demise necessitated this design, he he). You can also use a standard Estes deflector (figure 11.1). If you are better than I am at bending metal, you can cut a 1/3 section from a coffee can, bend one end over the top of the pad, drill a hole for the rod, and secure it with a couple of screws. Figure 11.2 shows my pathetic attempt at a coffee can deflector plate. And there you have it. The pad is quite sturdy -- it can hold Aerotech and The-Launch-Pad rockets easily, not to mention Estes and Quest rockets. The pad comes apart into several sturdy pieces that can be tossed into an old gym bag for storage and transport. I haven't tested the maximum weight so don't blame me if your 20 pound sounding rocket collapses the pad. Adjust the launch angle by loosening the two side wing nuts and repositioning the swiveling rod holder. Retighten when finished. You can also loosen the bottom wing nut to turn the entire U-frame left or right. I usually just lift the whole pad. Feel free to email me with any questions, comments, or improvements to the pad, or just to say hi. If you are a millionaire or just extremely appreciative for this design, you can Paypal me a few bucks. Enjoy the pad!